If you’ve been awake and paying attention in Britain over the last few months, you will have heard of the ‘strivers’ and ‘skivers’. These are apparently the two kinds of people in the country. Those that ‘work and want to get on in life’ and those that want to lie in bed in the morning and scrounge off everyone else. While the playground barking continues about who is actually on the side of the strivers, who are obviously the goodies in this equation, nobody appears to be actually questioning the premise of the argument. Who are these skivers who don’t work? The New Economics Foundation has launched a new series of ‘mythbusters‘, looking at some of the popular myths around economics and politics. This week’s is on strivers and skivers and includes this graph. It’s a breakdown of who gets benefits. See if you can spot the skivers that are apparently bankrupting the country. 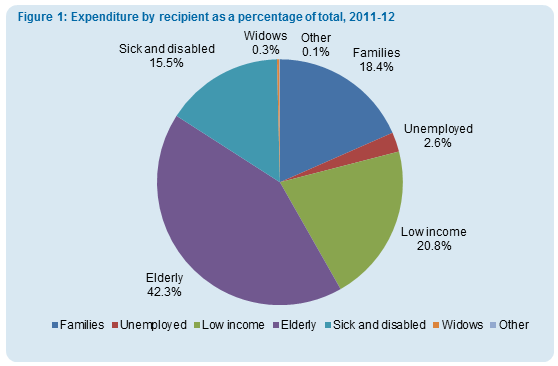 The fact is, the majority of the benefits budget goes to the elderly. 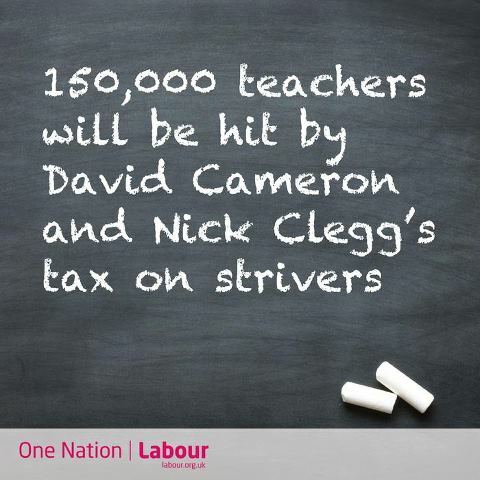 Of the rest, the largest share goes to those who are actually working, and to support low income families. A very small 2.6% goes to those who are fit to work but aren’t. Of that 2.6% on jobseekers’ allowance, just 10% have been claiming for over a year. So if you catch your MP playing the strivers vs skivers game, send them this graph. The skivers are the same people as they have always been. Lord Marchmain and his ilk who ride to hounds four times a week. Where do they get the money from to keep all those horses and things? There is an even deeper issue to think about which is what is meaningful work anyway? Much real and necessary work is done unpaid, such as raising children, caring for people, cooking dinners, cleaning the house, donating blood, local councillors and so on and if this work was not done, no one would be able to be employed because they would be starving dirty distressed neglected and not be able to get out of the front door because of the stinking rat infested piles of rubbish blocking the hall. It is all about exploitation this system. Our only value is our ability and willingness to be exploited by others for their benefit. It has nothing to do with how we actually live our lives. I’m so glad people are challenging these lies and misrepresentations. It’s astonishing that in a time when we’ve given out more in “welfare” payments to Bankers In Need that anyone can advance an argument that the welfare state for citizens is un-affordable. This distraction and scapegoating looks to me like part of an economic soft war being waged against us. And when you look at how rapidly the richest and most powerful are accumulating wealth, and the increase in poverty and the degredation of services we’re all experiencing, it seems we’re losing this war so far. If it’s not too cheeky, here’s a link to a piece I wrote about this a little while ago. I’ll link back to this piece too. Some good points there about transfer of wealth. What I find most odd is that the opposition have responded to the government’s divide and conquer politics with more of the same. If I were the Labour party, I’d be sticking this graph on billboards and saying the Tories are talking out of their backsides. I used to be dumbfounded by the lack of alternatives to these tactics, or to the increasing pace of wealth distribution from everyone else to the already very richest. But when you consider all 3 main parties are funded by the same people and corps, lobbied by the same interest groups, have shares in the same companies, and that we have no power of recall and no contract is made between the politician and the public who vote for him or her, it really isn’t so surprising. ”In the years that followed [the First World War], the “hard-faced men” and their political friends kept control of the Government. They controlled the banks, the mines, the big industries, largely the press and the cinema. They controlled the means by which the people got their living. They controlled the ways by which most of the people learned about the world outside. This happened in all the big industrialised countries.